Riots have broken out in the Somali town of Baidoa after a minister in the transitional government was shot dead. Minister Abdallah Isaaq Deerow was killed outside a mosque in Baidoa, where the government is based. On Thursday, at least 19 members of the transitional government - which controls only a small area - resigned. In another development, a second cargo plane has landed in Mogadishu, fuelling allegations that the Islamic forces who control the city are receiving arms. Mr Deerow, minister of constitutional affairs, was killed after Friday prayers at the mosque. Later on Friday, hundreds of people took to the streets of Baidoa in protest at his killing, burning tyres and looting shops. Mr Deerow was not among the group of ministers who resigned on Thursday. The resignations were prompted by some ministers' dissatisfaction that Prime Minister Ali Mohamed Ghedi had failed to make progress in talks with the Union of Islamic Courts, which controls Mogadishu. Public Works Minister Osman Ali Atto said he came back from the capital to the government's base with an agreement from the Islamic courts that fresh talks be held. But he said that Prime Minister Ali Mohamed Ghedi was "an obstacle to progress" and had refused to listen. Some MPs are planning a motion of no confidence in the government. They are opposed to the deployment of foreign peacekeepers and the presence of Ethiopian troops who are in Baidoa with the blessing of the transitional goverment. More resignations are expected and observers say that the transitional government is looking increasingly fragile. President Abdullahi Yusuf's government has little influence outside its base in Baidoa, but has the diplomatic support of the United Nations and the African Union (AU) and the strong backing of neighbouring Ethiopia. Many Somalis, including the Union of Islamic Courts (UIC) which controls much of southern Somalia, are opposed to the presence of Ethiopian troops on Somali soil. The arrival of a second flight at Mogadishu airport amid strict security has fuelled speculation that the Islamists are receiving weapons in violation of a UN arms embargo. 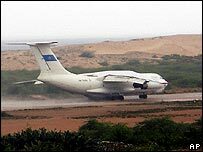 According to witnesses, the aircraft that touched down in Mogadishu was an Iluyshin-76 - a massive transport plane capable of carrying more than 50 tons of cargo. Troops loyal to the Union of Islamic Courts in control of the capital chased away onlookers, although at least six trucks were seen loading cargo from the aircraft. The plane is the same one that touched down in Mogadishu on Wednesday and credible sources said that flight originated in Eritrea carrying anti-aircraft guns, uniforms, AK47s and several senior Eritrean officers. Both Eritrea and the Mogadishu authorities have denied the claim. The flights have raised fears amongst security sources and diplomats that the rivals in Somalia are now preparing for open conflict, the BBC's Peter Greste reports from Nairobi. Both Ethiopia and Eritrea have been warned not to interfere in neighbouring Somalia by the United Nations and United States. There are fears that Somalia could end up a battleground between Ethiopia and Eritrea - who fought a two-year border war between 1998 and 2000.